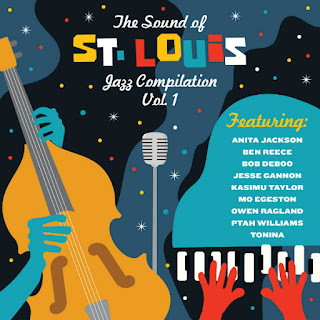 * Today is the release date for The Sound of St. Louis - Jazz Compilation Volume 1, an album featuring original music from the nine participants in the Kranzberg Arts Foundation's music artists-in-residence program. The album (pictured) will be available on streaming services, as a digital download, and as a CD, which will be sold locally at Vintage Vinyl, Music Record Shop, and Euclid Records, and at various KAF-affiliated venues such as Sophie’s Artist Lounge and The Dark Room. * In more album-release news, singer Erin Bode is reissuing her 2016 album Here and Now as a vinyl LP, and will perform on Thursday, April 11 at The Sheldon to commemorate the event. * One of singer Marilyn Maye's performances last week with the Jazz St. Louis Big Band was reviewed by KDHX's Chuck Lavazzi. * Singer and St. Louis native Alicia Olatuja was interviewed about her new album Intuition by the St. Louis American's Kenya Vaughn. * Also as reported in the American, four branches of St. Louis County Library now offer musical instruments, including guitars, keyboards and hand drums, that can be checked out by library patrons for free. * Multi-instrumentalist and singer Tonina was profiled for a new local website, TheSTL.com, by writer Daniel Durchholz. * NPR once again this year is holding a contest for unsigned musical acts that would like to perform in a Tiny Desk Concert, filmed at the network's HQ in Washington DC. Local affiliate St. Louis Public Radio has details on the contest and how to enter here.